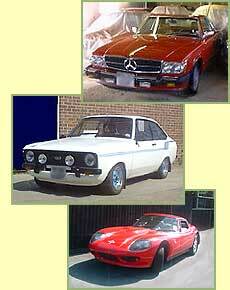 Purchase interesting vehicles for sale or take vehicles on consignment for clients. We are also pleased to act as representative for clients from the UK and abroad, both in the sale and purchase of vehicles. Tell us the vehicle you require and we will work to locate it, sending details of possible finds to you, anywhere in the world. When buying a classic vehicle having a specialist inspection carried out prior to purchase is always advisable, especially if you are unable to view the vehicle in person. See our links page for contact information for companies specialising in pre-purchase inspections, insurance valuations, etc. Please contact us for further details or more photographs of the above.